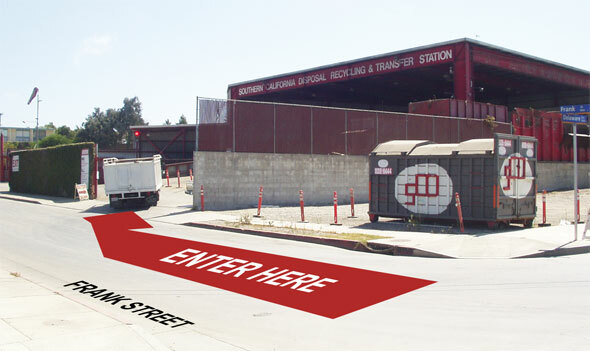 Southern California Disposal & Recycling Company operates the only privately run disposal site open to the public on the west side of Los Angeles. Our convenient location makes it easy for businesses, construction crews, gardeners, and residents to bring their construction debris, trash, dirt and concrete, green waste, e-waste, cardboard, and other items for recycling and disposal. Directions from the 10 Freeway westbound: Turn right at the Cloverfield exit off the 10 Freeway. Turn right on Michigan Avenue. Make the first right onto 24th Street. 24th Street curves to the left and turns into Delaware. Continue to the end of the street and turn right on Frank Street. The transfer station is on the right.